Undoubtedly the largest Hippo Population in South Africa occurs in the area of iSimangaliso Wetland Park, and St Lucia is situated in the heart of Hippo Land. it is estimated that 800 Hippos roam the area and yes we get to see them regularly. Not only in the Estuary but in Town and in the residential areas on a regular basis. St Lucia, South Africa truly is home to the Hippo. The area is frequented by approximately 800 Hippos the largest population in South Africa. It is a common occurrence to witness these giants at night as well as day time as they wander the streets in search of greener pasture. Hippos are Dangerous and therefore care must be taken when one comes across these animals. The local residents have become accustomed to them however caution is still practiced. Not only have the residents become used to the Hippos but the Hippos have to become accustomed to cars, lights and the continual flashlights of cameras. Without a doubt this coexistence between man and animal seems to be one of respect. Either parties now the boundaries and this thin line continues. Warnings and Cautions are displayed throughout the town, when one arrives in town all accommodation establishments will undoubtedly let you know about the Hippos the cautions and restraints that one should take. St Lucia is surrounded by water, the west by the Estuary and on the East the Indian Ocean. The St Lucia Estuary is home to an impressive 800 Hippos. This is the largest population of Hippos in South Africa. 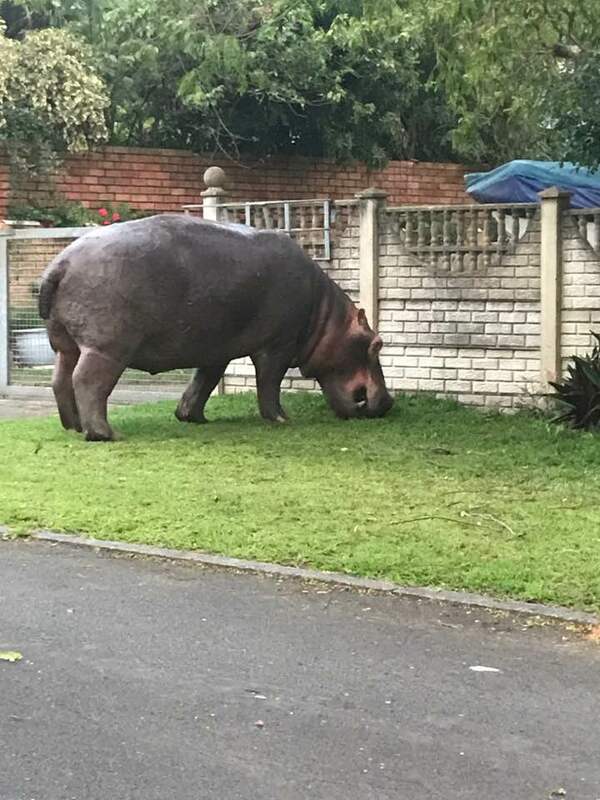 Hippos are seen during the day in town however this is not a regular occurrence. As one can imagine when this does occur it causes quite a stir in this small village home to plus or minus 500 permanent residents. To see them during the day in Town is but incredible, to date not a single incident has occurred during the day. We have complied a lengthy Hippo Facts and Information which makes for some interesting and informative reading. What should one do when one comes across a Hippo? Make sure that you do not approach the animal, ensure that you have not blocked the Hippo in any manner what so ever. Should the Hippo feel that he is restricted in his movements he may turn on you. Yes Hippos are Dangerous and cause the most deaths of any animals in Africa. No Hippos can not swim, Hippos run or walk on the bottom of the water source. How Fast are Hippos in Water? Taking into account their size and weight Hippos are incredibly fast in water Hippos can run at an alarming speed of upto 24 km/h. Hippos will remain in the water for the majority of daylight hours. However Hippos may also be witnessed on the banks of the St Lucia Estuary however this is mostly during winter. iSimangaliso Wetland Park stretches from St Lucia in the South to the border of Mozambique in the North. The park is incredible in diversity and wildlife. Make St Lucia your next stop.